In case you haven’t heard already, Duke’s basketball is the preseason #1 and the favorite to win it all again this year…and although it’s hard for me to totally disagree with that, that’s assuming the stars align themselves again this year as they did last year. I know that’s what makes the tournament so special, but come on people, Duke was not the nation’s best team last year, and they better be glad that college basketball is not set up like college football, or they would not have even been in the championship game. Duke had the easiest road to the Final Four of any team in the tournament, and then they played Butler in the title game, who was merely inches away from beating the all mighty dookies? It just amazes me that in an obvious down year Duke is put in the easiest side of the bracket you could hope for…and because of that they won, which set them up to be ranked #1 and favored to win it all again this year? We will see…but until then, I have something else to rant about. If I hear about Mike Krzyzewski taking his team to 11 Final Fours and how great of an accomplishment that is one more time I think I might just set something on fire!! Durham perhaps! :) But seriously, you can argue that Coach K is one of the greatest coaches ever, especially since he takes mediocre teams and makes them “ACC Champs” time and time again, but making it to 11 Final Fours and only winning the national title 4 times is not all that great…is it? That means he’s lost the damn thing 7 freaking times! All I know is Mike freaking Krzyzewski better do more than make it to the Final Four this year with this so called all star team, or else that will be 8 freaking times he’s lost in that glorious Final Four he makes it to oh so many times. Okay so I’m hopping off my soap box now. Does Duke have a great basketball program? You bet they do!! Do they have one of college basketball’s greatest coaches ever? Yes again!! But let us not forget about the little university 8 miles down the road that help put those dookies on the basketball map. Without those Tarheels the dookies would be nothing, of course you could argue that those Tarheels would be nothing without those dookies as well. Duke has had a basketball program since 1905 with an all time record of 1914-822. They also had a 5 year head start on the UNC basketball program, but still trails in all time wins. The UNC basketball program started in 1910 and their all time record is 2004-718. UNC leads the series between the two teams 130-99. The bottom line is that I don’t like Duke, never have, and never will. But, I also realize that the two teams (as much as they hate one another) are deeply connected, and both would be less successful if the other didn’t exist. 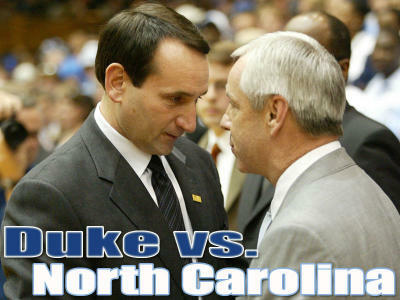 Let us all prepare ourselves as we await the battle between good and evil…it promises to be a lot different on Tobacco Road this year.